Getting ready for Stout Month but can't wait for February? No problem! 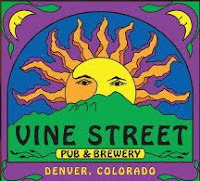 The new Vine Street Pub & Brewery is going to host a preview party. The following are details posted today from Mountain Sun Pub & Brewery. Only a couple weeks until Stout Month! For those of you who can't wait, we're throwing the Stout Month Preview on Saturday, January 28th at 3pm in the BRAND NEW Vine Street Brewery. Tickets are on sale NOW at all three pubs and are only $50. Get your tickets soon because this event will sell out. Stouts to Sample: Oatimus Prime Imperial Oatmeal Stout (BRAND NEW RECIPE), Old School Dry Irish, Trickster, Chocolate Dip, Addiction, Dropkick, Stoked Oak, Nihilist, Girl Scout, and Korova Cream. - Toast Crisp with sharp cheddar cheese, apricot compote, and drizzled with a stout reduction. - Poached pears, Gorgonzola, crushed pistachios, and a honey drizzle served on toast. - Candied Grapefruit rinds dipped in dark chocolate. - Vine Street hosts Uptown Block Party. - Vine Street Belgian Beer 101. 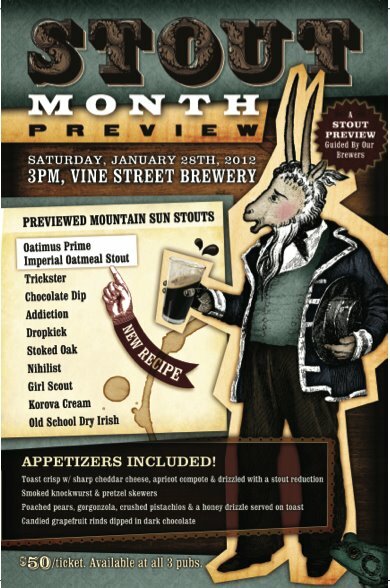 - Mountain Sun's Stout Month 2010.